High Quality Content by WIKIPEDIA articles! Ranitidine hydrochloride is a histamine H2-receptor antagonist that inhibits stomach acid production. It is commonly used in treatment of peptic ulcer disease (PUD) and gastroesophageal reflux disease (GERD). Ranitidine is also used alongside fexofenadine and other antihistamines for the treatment of skin conditions such as hives. 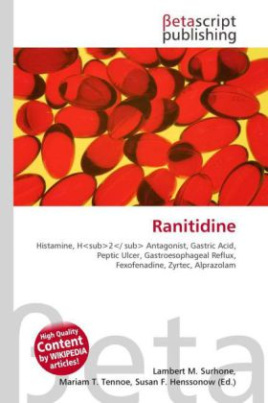 Ranitidine HCl is marketed under the brand name Zinetac or Zantac (not to be confused with Zyrtec or Xanax).Certain preparations of ranitidine are available over the counter (OTC) in various countries. In the United States, 75 mg and 150 mg tablets are available OTC. Zantac OTC is manufactured by Boehringer Ingelheim. In Australia, packs containing 7 or 14 doses of the 150 mg tablet are available in supermarkets, small packs of 150 mg and 300 mg tablets are Schedule 2 Pharmacy Medicines. Larger doses and pack sizes still require a prescription.